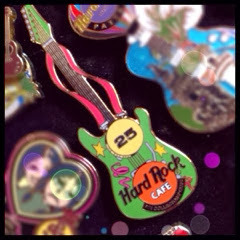 Not too sure how well you know this about me but I am a Hard Rock Cafe Pinhead. Even I forget about that sometimes; when people asks me what my hobbies are, I would immediately think of coffee and the buckets of 'em that I love drinking. Started off in 2006 when I got my first HRC pin from Amsterdam while Dida was getting the Leather Classic series tee to start off her collection. 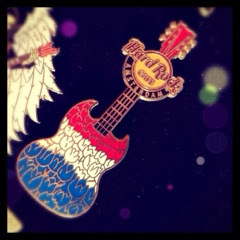 I love that Amsterdam pin.. It couldn't be any more Dutch than that! 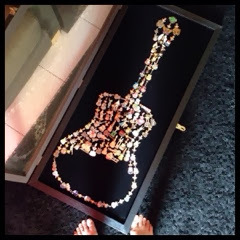 Since then the leather-logo tee has been discontinued, so Dida had to move on and started to collect the Wood Panel series tees and I carried on with my guitar pin collections. And I normally buy just ONE from one location. I don't know.. I'm an odd sort of pinhead, maybe? I guess I collect them more because of "I've been there" instead of "while I'm there".. does that make any sense? Anyway, I love how I can practically tell a story of each and every pin, how I acquired them and the adventure it took to get them! Which is why I'd never consider trading my pins with any of the other pin collectors whom have approached me. It's also interesting to see what others would get me when they actually bought some for me. I've never been to the States so obviously the ones in my collections weren't hand-picked by me. And Bestie somehow always end up getting the Burlesque girls for me; which I think says a lot about him! HAHAHAHHA!! Despite getting these pins as tokens sometimes, I still want to go to each location myself! Being VIP in the Rewards program means that I will be rewarded at a certain numbered visits. So yeah, no Ebay purchase will do it for me. Suppose it's like a challenge to myself. Plus, it's something to look forward to when I go to some place new. Kinda irked that I only knew about Jakarta's new location once I was back from my trip. Also of Andheri on the night before I left Mumbai.. gahhh!! NEXT TIMEE!! You could see Dida's tee collection on her Facebook album here and my pin collection here. Can't remember when was the last time I updated that though.. Probably a long time ago since there's 58 photos on there while my pin locker on the HRC collector's club has eighty-something! I guess it's about time that I update that album..
Oh, in case anyone was wondering about the custom-made case that holds all my pins, it was actually a birthday present from Encem three years ago..? fuyoooo..siap ader casing sendiri?? pandai ko susun jadi bentuk guitar pulak tuh! Hehe bentuk guitar tu sebab perasan macam dalam cafe dia.. Display cantik cantik!